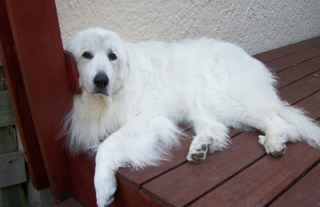 I adopted Maggie from the Great Pyrenees Rescue in Minneosta 10 years ago. She turned 11 last March. She lived on a sheep farm in Wisconsin and wouldn't stay with the sheep so her owners didn't want her. She kept jumping the fence and went to the neighbors house and they said that they were going to shoot her if she came over there again....that's when she ended up in the shelter. She's a failed livestock dog....but a successful therapy dog. She has made a lot of residents happy at the nursing home where I work. She is so gentle and sweet....my BEST friend!!! I have seen residents that hardly talk or smile and when Maggie visits them, some of them smile and talk immediately. They will tell you stories of their dogs that they had....some of them really become excited and alive again. Years ago before HIPPA, you could take pictures of the residents....but now you can't because of confidentiality. I'd have a whole book of pictures of happy residents and their families if I could have taken their pictures. My vet told me that Maggie probably didn't stay with the sheep and guard them because she was 4 months old when she arrived at the farm and she needed to be with the sheep at an earlier age so she could bond with them.